On my last visit I was determined to seek out these other hidden secrets. 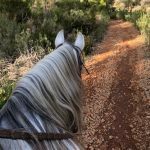 I love horses and have been riding since I was ten so It seemed only natural for me to check out the horse riding scene in Ibiza. A quick consultation online showed that only three places on the island that take tourists trekking on horseback. Two of these were based in the north of the island, which is reputed for its untouched and beautiful countryside. 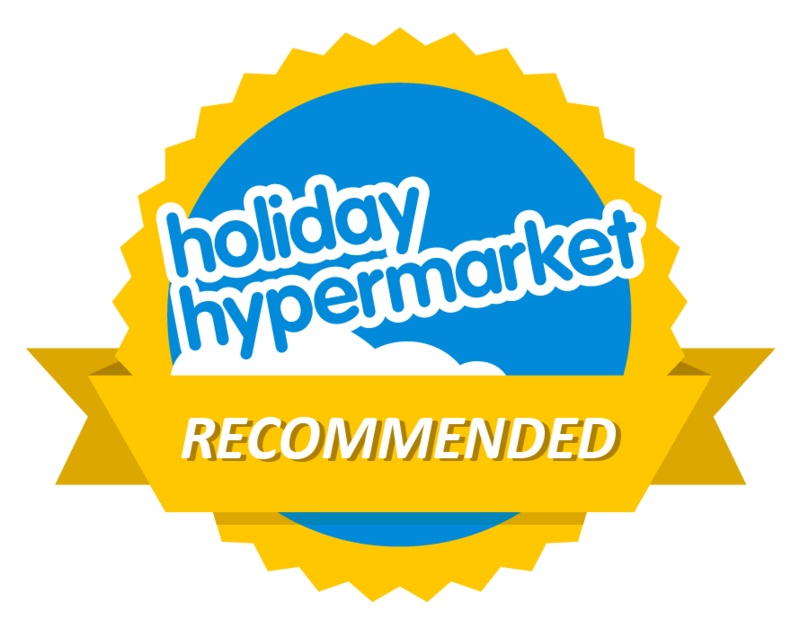 We liked the look of North Ride Ibiza, it seemed to offer a more personal experience, so we gave them a call. Following a short chat, to determine our size, weight and riding ability, we arranged to meet the owner, Rumana, at her stables in San Joan. She sent us the location and gave us an overview of the journey. The drive up to the north of the Island was pretty smooth and easy. The further along the road we got the less and less populated the land became and we felt that we were really heading out into the sticks. We arrived at the village of San Joan and were surprised at how small and quiet it was. This wasn’t our destination though, we still had to navigate up into the hills to reach the stables. We turned left out of the village and after a short distance along a winding country lane, we took a sharp right onto a narrow dirt track and went up into the hills. The scenery opened up into postcard picture of rolling hills and valleys, though the views were absolutely spectacular, it’s hard to ignore the huge drops off the side and into the valley below. The whole thing is very impressive. I hadn’t felt this much of a sense of adventure for a long time and we weren’t even on the back of a horse yet! After a gripping Camino journey, we arrived at the stables. The horses, six in total, were relaxing in their paddocks under the shade of pine trees. They all look very happy, healthy and relaxed. We see many reports of animals used for tourist attractions, being exploited and abused so it’s always a bit of a worry when choosing to support this industry. The animals here, however, are obviously very well cared for and have an immensely high standard of living. Rumana is there to welcome us. 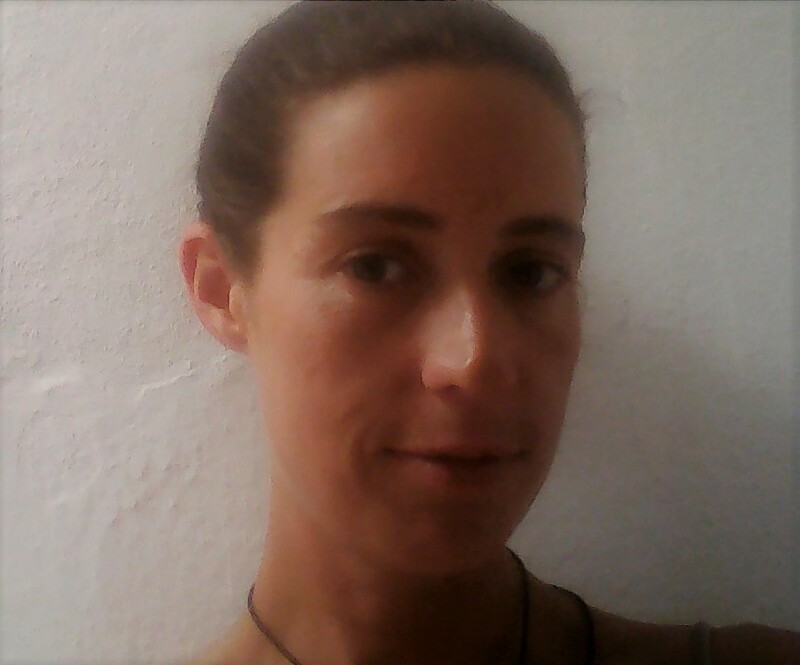 She is from Germany and speaks fluent English she even has a fantastic grasp of the British sarcastic humour. We can tell right away that she is a down to earth, no-nonsense, horsewoman and she makes us feel immediately at ease. You can tell, by the way that Rumana talks about her horses, that she adores them all. We’re also greeted by a few friendly cats, keen to extract strokes and cuddles from us. Rumana explains about the cat overpopulation on the Island. Between her and the other woman living here, they feed over twenty cats in the area. Fortunately, there is a British charity called Care4Cats that are helping out by sterilizing many of these wild felines each year. There is a donation box on the yard so we’re happy to drop a few coins in. We had chosen the basic tour of an hour and a half, due to Becci being a beginner, but North Ride offers several different packages. These include a sunset picnic tour (how incredibly romantic), Half day rides or full day excursions. Unfortunately, during the summer it is forbidden for horses to go on the beach in case they startle the sunbathers. Out of season, however, it’s possible to go galloping on the sand and even take a dip in the sea with your new equine friend. Now is the time to meet our appointed mounts for the day. I myself am an experienced rider but for my sister, this is a very new and nerve-wracking experience. Rumana thinks that Saratan, a handsome white, Spanish bred horse, is the one who will do the best job of taking care of her and building up her confidence. I am put under the care of Lilith, a black mare and the youngest of the bunch. 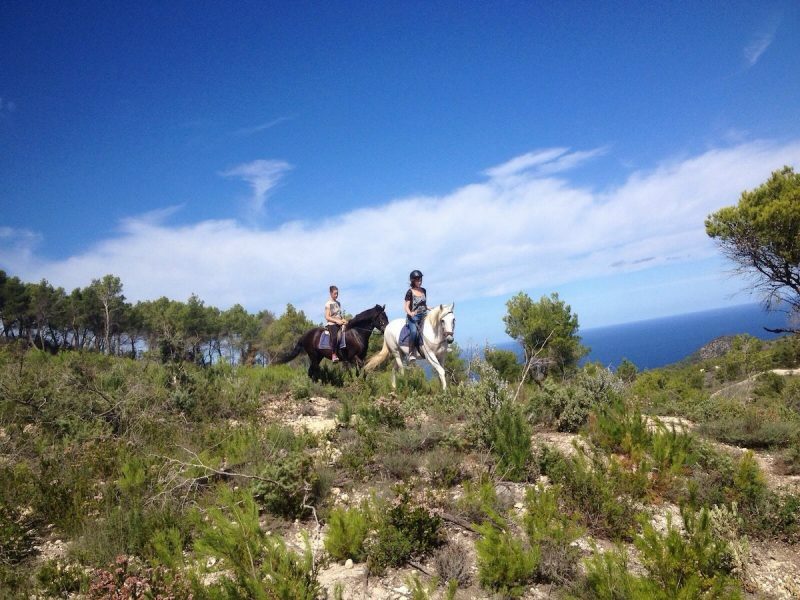 Rumana will be riding Moll, a very big, black horse from Menorca and her first horse here in Ibiza. Before the riding begins, we spend some time on the ground with our horses, brushing them and getting to know their characters. Lillith really enjoys being brushed and it feels like I’m petting a big dog, she even leans in for a cuddle sometimes. She is a very sweet horse and I’m feeling confident about riding her. introduced and acquainted, it’s time to saddle up and hit the road. Rumana is being very supportive towards my sister as a beginner, spending lots of time instructing Becci and helping her to become more confident. We set off in single file with Rumana and Moll leading, Becci and Saratan securely in the middle with myself and Lillith cruising behind. I can sense that Becci is a bit nervous but she has a huge smile on her face, confronting and overcoming fears can cause a big mental buzz it seems. The pace and horses are very relaxed and the feeling is infectious. Now that we are all comfortable, it’s time to sit back and literally enjoy the ride. After the initial shock from the drive up here on the dirt roads, it’s now possible to appreciate the dramatic scenery and the isolated feeling of tranquillity, accompanied by a soothing rocking motion and the hollow clopping of hooves. rich in the air. We can see some traditional flat-roofed farmhouses scattered in the distance, as well as lots of fig and almond trees. 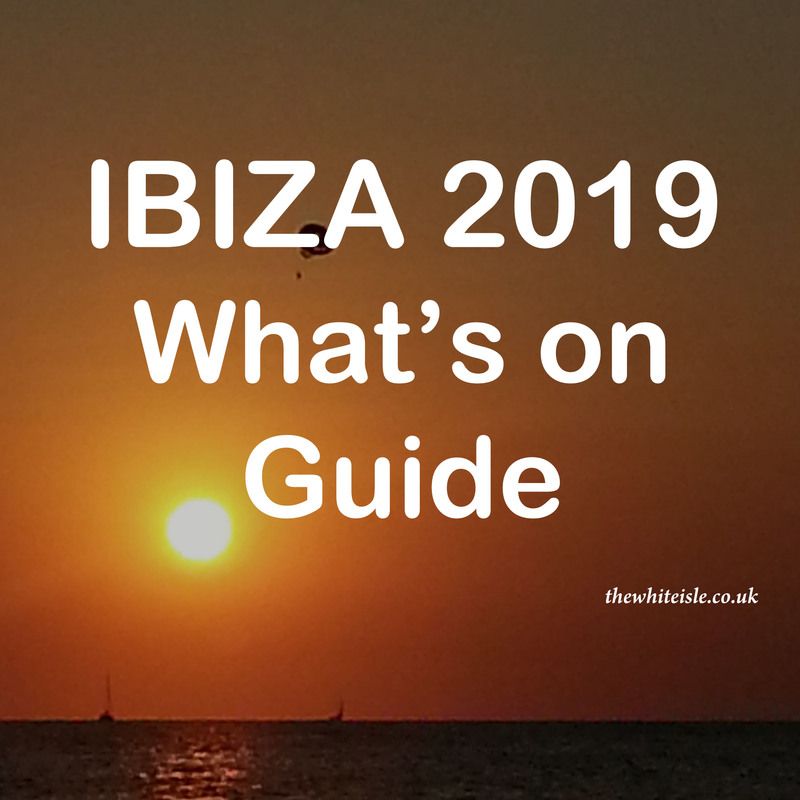 So this is what the real Ibiza is like? So far the ride is going well. Rumana can see that we’re looking happy and confident, so she asks us if we would like to step up a pace into trot, or second gear for the none horsey amongst us. I’m totally up for it and with a big boisterous smile, Becci agrees too. Away we go, making a cloud of slight dust, bobbing along in unison. At the halfway point we ascend a hill that delivers a spectacular 360-degree view across the island, and out over the whole northern coastline. 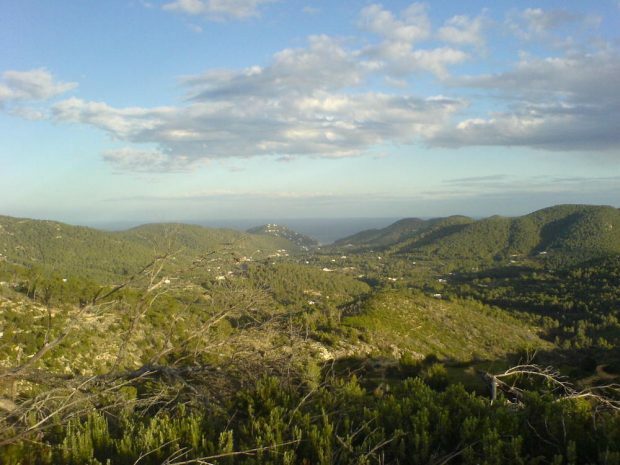 Down below us, the village of San Joan is dwarfed by the surrounding countryside. This view will stay in my heart and mind forever. Kindly Rumana offers to take some photographs of us in our finest moment and as proof of our heroic horsey adventure up in the mountains. It’s time to head home to the stables and we’re riding like cowboys now, super relaxed and moulded into our saddles. The horses are a little bit sweated when we get back, so after taking off their riding gear and giving lots of pats, praise and carrots, we help Rumana to hose them off. I feel like I’ve really made a friend in Lillith and I’m sure that Becci will never forget Saratan and the confidence she gained from him. Rumana has been a great guide and hostess. 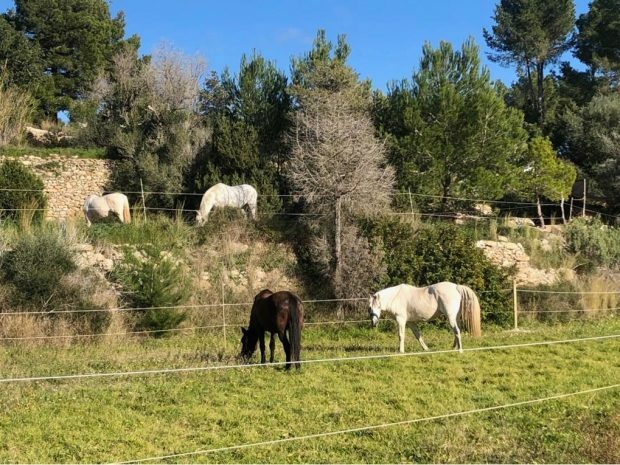 She is doing a wonderfully good job with her horses and curious tourists seeking out the “other” side of Ibiza. This was a fun-filled adventure that not only motivated us to finally explore the north of the island but also gave us a touching experience that will stay with us for a lifetime. 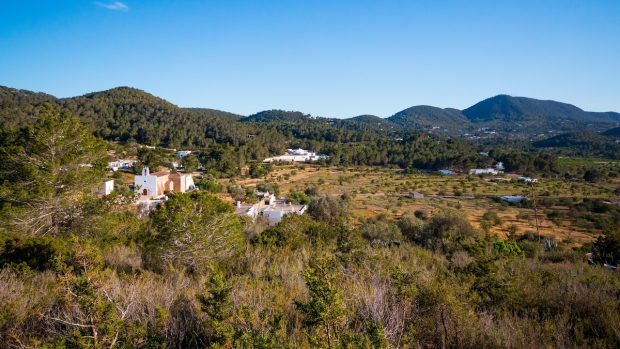 We left not only more bonded with each other but also with Ibiza and it’s beautiful countryside.